Be the first to share your favorite memory, photo or story of Eric "Rick". This memorial page is dedicated for family, friends and future generations to celebrate the life of their loved one. 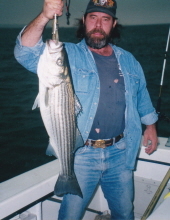 Eric “Rick” Schuh of Felton died on Thursday, March 28, 2019 in the loving care of those he considered his true family, Ethan and Lena Vogl. Rick was born December 20, 1960 in Dover, Delaware and is the son of the late Jacob “Jack” Schuh, Sr. In addition to his father, Rick was preceded in death by his brother Jacob “Jackie” Schuh, Jr., sister, Diana M. Weyant, and grandparents, Joseph J. and Mary P. Schuh. He was employed by the State of Delaware. He retired as a materials laboratory technician for the Delaware Department of Transportation. Rick’s retirement was spent spending time with his true family and friends camping, boating, and more. He loved drag racing, Mopar, Harley Davidsons, and NHRA. Rick had a heart made of gold and he was kind to everyone, including animals that needed a place to stay or food to eat. Rick is survived by his “true family” including his nephew, Matthew Jacob Schuh and his mother Denise C. Schuh of Roanoke, VA, Mark E. Weyant of Dover and Ethan and Lena Vogl of Hartly. Funeral services will be held 2PM Saturday, April 6, 2019 at Torbert Funeral Chapel South, 1145 E. Lebanon Road (Rt.10), Dover. Friends may call one hour prior. Interment will be in Holy Cross Catholic Cemetery. In lieu of flowers the family suggests contributions be made to First State SPCA and Animal Shelter, 32 Shelter Circle, Camden, DE 19934 or American Cancer Society, 92 Reads Way, Suite #205, New Castle, DE 19720. To send flowers or a remembrance gift to the family of Eric "Rick" P Schuh, please visit our Tribute Store. "Email Address" would like to share the life celebration of Eric "Rick" P Schuh. Click on the "link" to go to share a favorite memory or leave a condolence message for the family.